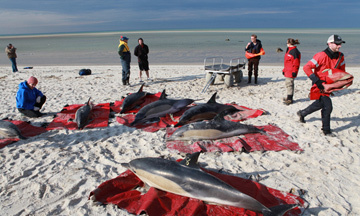 International Fund for Animal Welfare (IFAW) rescue teams tried to save as many common dolphins as possible that persisted stranding, re-stranding and dying between Barnstable and Wellfleet in Cape Cod between January 12 and February 14, 2012. 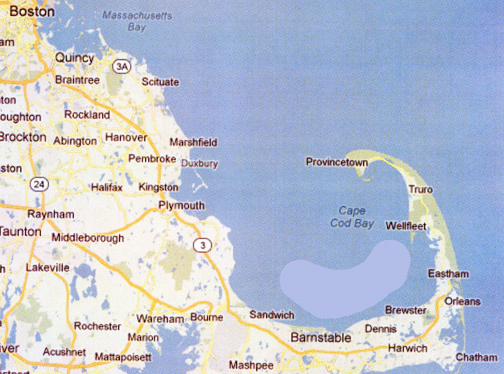 Light blue area between Wellfleet and Barnstable on Cape Cod, Massachusetts, is where 179 common dolphins stranded, re-stranded and died between January 12 and February 14, 2012, unprecedented in Cape history. February 24, 2012 Silver Spring, Maryland - The common dolphin is the name given to two species, and possibly a third, of dolphins making up the genus Delphinus. Those species are the short-beaked common dolphin, Delphinus delphis; the long-beaked common dolphin, Delphinus capensis. 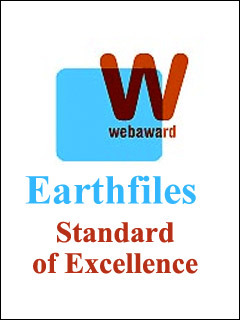 Some studies suggest a third species, the Arabian common dolphin, D. tropicalis, that has an extremely long and thin beak and is found in the Red Sea and Indian Ocean.